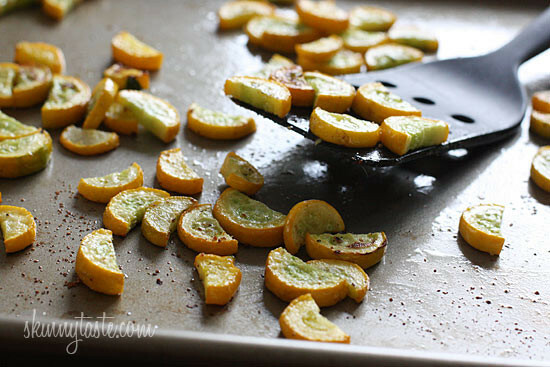 Roasted summer squash is simple and delicious, it really doesn’t get easier than this! There’s something about roasting vegetables that makes them taste so good. You’ll be surprised to see your family go back for seconds and it really doesn’t require much effort. Toss it with a little olive oil, season it to taste an roast while you are preparing the rest of your meal. You can even take it up a notch and top with shredded parmesan cheese. See how quickly it disappears! And yes, you can do this with zucchini as well. I went to the Union Square Greenmarket Monday with my friend Amy who writes a gluten-free blog called The Healthy Apple. I’m always like a kid in a candy store when I go to farmer’s markets, is it just me? I fell in love with the color of this squash, the tips looked like zucchini but the rest was a bright yellow. Amy and I bought lots of veggies and we are both planning on making something with our goodies. Stay tuned for next week’s post to see how both of us come up with different ways to prepare a dish with our farmer’s market finds. Until then, enjoy this simple side dish (you might even want to double it)! In a medium bowl combine yellow squash, olive oil, garlic powder, salt and pepper and toss to mix. Place the squash on a baking sheet in a single layer and bake in the lower part of the oven 10 to 12 minutes, or until the bottom is golden. Remove and serve immediately. I've never roasted squash before. I think that's going to change staring next week. Thanks for sharing! 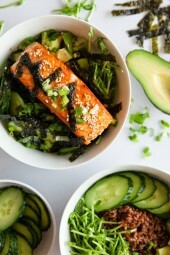 This was great – so simple, tasty, and healthy! I used green zucchini and it was amazing! I never comment/leave reviews on recipes but this was so unexpectedly good, I had to. I ate it like candy. This is great, works for a lot of vegetables! 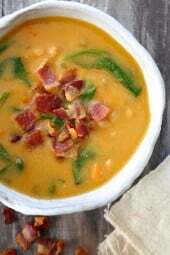 i've had this recipe for the last 3 days, lunch and dinner, just because it is so simple and amazing!!! nice to know the nutritional information! thanks! I made this the other night using zuchinni as that is what I had on hand. I followed the exact same recipe and it was yummy! Thanks for sharing! I love roasting yellow summer squash with fennel. The yellow summer squash turns so buttery when roasted, even with little or no oil. The fennel somehow is just a perfect match for the buttery squash – offering extra sweetness and a touch of savory flavor. I can't wait for fall! I roasted summer squash and zuchinni like this on the grill then tossed with a lemony basil pesto. This is how I always make butternut squash! I mix it all up on the roasting pan. ( olive oil, Paula Deen's House Seasoning) So good! I have an overabundance of squash in my house (fresh out of our garden! ), and we do this ALL THE TIME! Oh yum! I made roasted yellow squash this week, but I peeled it into long "noodley" strips before hand and served it with fresh tomato sauce. These look amazing too though. Sautee and caramelize Onions and a jalepeno pepper in olive oil. Slice up squash and cook down with no water, delicious! Nice I can't wait to try it myself. 🙂 I would like to share my Low cal potato chips recipe. :). Potato Chips is one of the most loved snacks preferred by all ages. Every time we shop for groceries we are tempted to buy one of this crunchy chips packets. But we are always worry about the calories they will bless our body with and move on. I have tried the "baked" versions but nothing comes to the deep fried potato chips with loaded calories. I was going to saute my green and yellow squash but saw your recipe and decided to roast them. I substituted beautiful red salad onion in wedges for the garlic, and did it for about a half hour, and they were caramelized and spectacular. Thanks for the inspiration! I love roasted veggies. This simple recipe can be used for many different veggies, broccoli, carrots, green beans- love them all. sounds good and so simple. I am making this recipe tonight. Me too, I love Farmers Markets. Just got back from SLO(San Luis Obispo) in Central California. The Farmers market every thursday is one of the largest I have ever been to. yummy! i love roasted squash and zuch. i use more than a pince of garlic powder though. lol. i also slice up onion and roast it right on the pan with it!! so good! Such a simple and great idea! I just got a bunch of yellow squash in my CSA box last night! How did you read my mind that I needed a recipe for it? Thanks! I will be testing this out tonight! 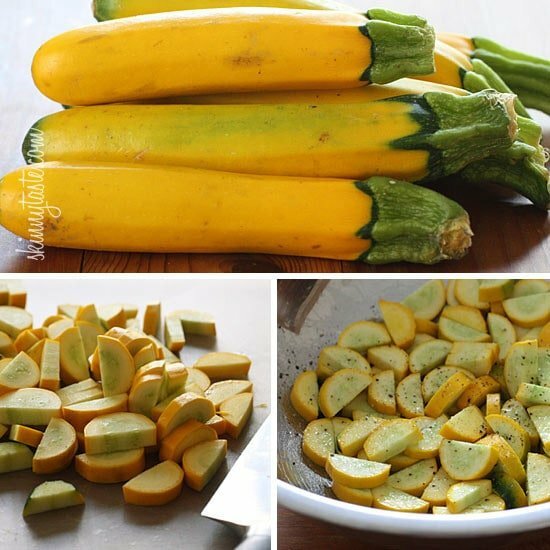 I tried this last night with some yellow crookneck squash I am growing in my garden and it was great! For the yellow squash, my mom taught me to cook them using NO water. Put the butter or olive oil and onions in the bottom of your saucepan, sliced squash on top, cover with a tight lid and cook on LOW heat. In a few minutes, the squash will make enough liquid to cook them in and you won't even have any water to drain off. They are more flavorful this way and you keep all the vitamins, too! I love roasting vegetables of all kinds. Last week I did a mixture of yellow and zucchini squash, sweet peppers, onion, mushrooms, grape tomatoes, garlic and some small fingerling potatoes. My grandsons loved it, their mother was amazed! The leftovers went into a pita the next day with a little feta cheese for my lunch. I simmer sliced yellow crookneck squash in a small amount of water until it is just starting to lose its white color around the skin part of the squash. Then I add about 1/2 cup sliced sweet onions to pan, lid on, until both vegetables are done but still a little firm. I drain the water and add 1 to 2 Tbsp. real butter to melt, salt & pepper it and serve. My family LOVES yellow squash this way. This was so simple and good. I used it on assorted veggies and was AMAZED by what I could get my husband to eat! Love roasted squash! Squash is one of my favorite foods this time of year! Yum!! Love it! Looks so delicious! Thanks to that recipe! The farmer who I have been buying these from call them yellow zucchini which are different than yellow squash and taste different as well. Both are sooo yummy, but defintely have a different taste. In addition to cooking them in the oven, in the summer, I saute either the zucchini or squash with onion, garlic in olive oil and at the end throw in a a couple of handfuls of grape tomatoes. If those are not available, i dice up fresh tomatoes and use those. At the end, some fresh basil…soooo good. Maria. I do something similar by sauteing both yellow squash and zucchini with the onion, garlic in olive oil, but add fresh mushrooms and instead of fresh tomatoes I use a can of stewed or diced ones. My family loves this dish! 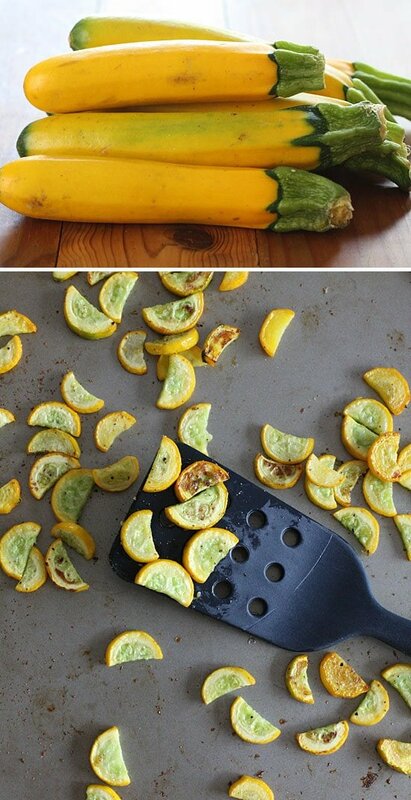 I am ready to try it roasted though…I roast other vegetables but have never tried yellow squash. Yes, I love grilling squash and zucchini! These look fantastic! We just bought some of these last week while in Niagara and I must say, they're a whole lot tastier than a zucchini. I'm growing yellow zucchini this year. Those are definitely them. I'm excited to get your recipes because I've got zucchini running out my ears! Wow the squash looks good and I am going to try it on the grill also. Thanks.. I'm going to try this one on the grill! I agree, those do look like zucchini. They are def. in the squash family! Golden zucchini, love the sound of that! That's definitely golden zucchini – you can tell by the stems! That’s not the yellow squash, but is still very tasty! 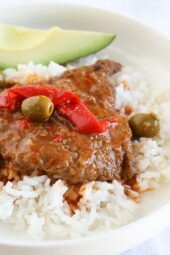 I make this all the time during the summer, so simple and delicious! I love squash but sometimes need new ways to prepare it. YUM! I love yellow squash.